The remasters series uses fresh 2014 transfers from the original analog masters via the new Plangent Process, and newly remastered by acclaimed engineer Bob Ludwig, working with Springsteen and longtime engineer Toby Scott. Pressed on heavyweight, 180-gram vinyl, in sleeves that recreate the original packaging and inserts. 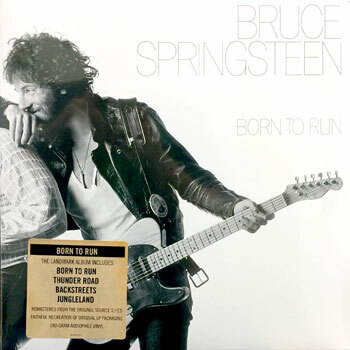 This reissue of 1975's Born to Run LP is in a gatefold jacket, which opens to reveal another Eric Meola photo and complete lyrics on the inner spread. Plain inner sleeve as originally issued. Cover photograph restored to sharp & clean glory, after years of muddy repressings. This is an individual album. Looking for the full set of seven, in a box with exclusive booklet? We've still got the Album Collection Vol. 1, 1973-1984 box set, still on sale.